switching current up to 5A resistive, 2.5A inductive. Designed for use in the HVAC industry, where reliable air proving is critical to both performance and customer safety, the LF31 is a favorite with leading manufacturers of gas-fired warm air furnaces and water heaters. 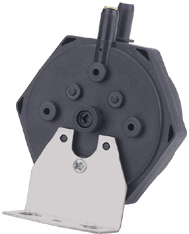 Smaller and lighter than any other HVAC pressure switch, the LF31 is built for the same temperature range and operating life as conventional switches made of stamped steel. The LF31 will perform equally well in other applications which demand low OEM unit cost, robust design, setpoint accuracy, and high reliability. The LF31 features a unique integral snap switch, with positive snap action and self-wiping silver contacts for ultra-reliable switching. The molded silicone diaphragm converts very low pressure or vacuum into movement of an actuator disk, which operates the silver alloy contacts. Operating Pressure Range 0.15" W.C. to 34" W.C.